I love Christmas. It’s my happiest time of the year. I love the lights, snow (if we have it), making decorations with the kids and the annual fish dish I make for family at our house on Christmas Eve. We are a family, who make magical reindeer food from oats and glitter to leave on our drive. We have a homemade Christmas Eve plate and I’ve always had a Christmas Eve box even when I was small. My mum loves Christmas too and the highlight of last year was the Christmas fair in our town with vintage bus rides, lights and caroloke at the church. When we write the children’s christmas letter to Father Christmas we use fire magic and pop them in the woodburner. I’ve already posted on the blog our unboxing of the Lego and Playmobil advent calendars. Click on the link to see. The spirit of Yuletide is strong here. So when it gets to the first week of October and Little Bird launch their Christmas range; I’m there. Up at 5.30am with the smartphone ready. It wasn’t a hardship T had already woken me at 4.30am anyway. The thing about Little Bird is they get it so right a lot of the time. It makes it so hard to pick and choose. 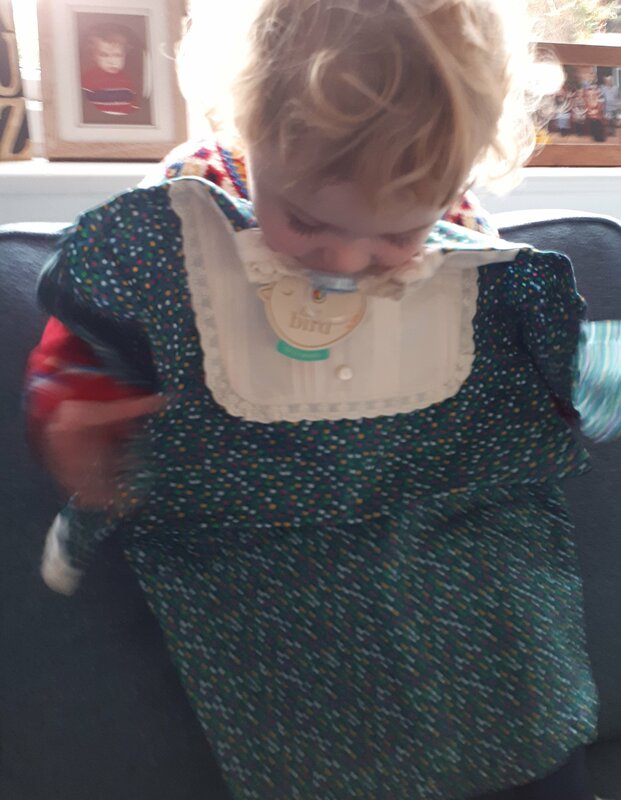 I needed a Christmas dress for G and Christmas jumpers. 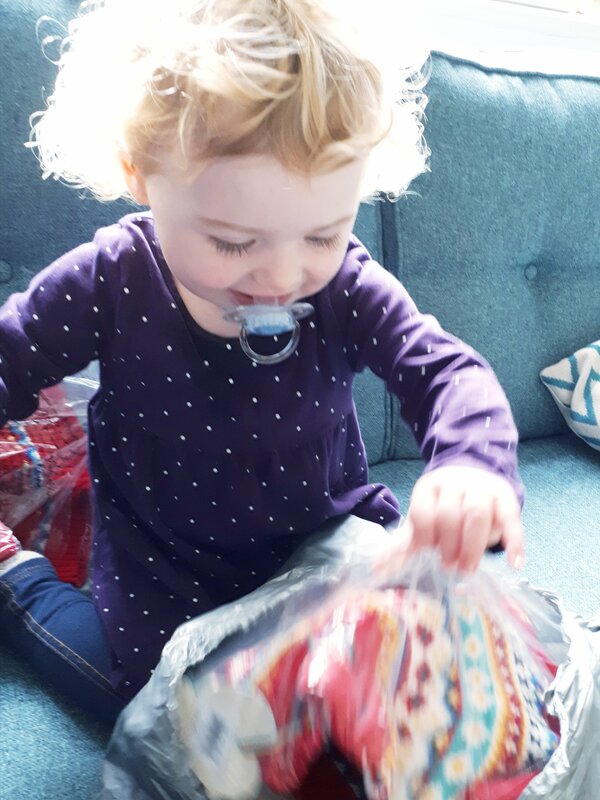 If money was not a consideration then my list would have been much longer with chocolate jumbo cord trousers, rainbow roll necks, rainbow striped leggings and cord pinny dresses. Floral ‘Wednesday‘ dress Ivy from Memyselfandivy.com made it look so beautiful; Amy and her gorgeous children were invited to share the sparkle of the Christmas photo shoot and model the outfits. Click on the link above to see Amy’s blog. So right that superfans are treated so well. 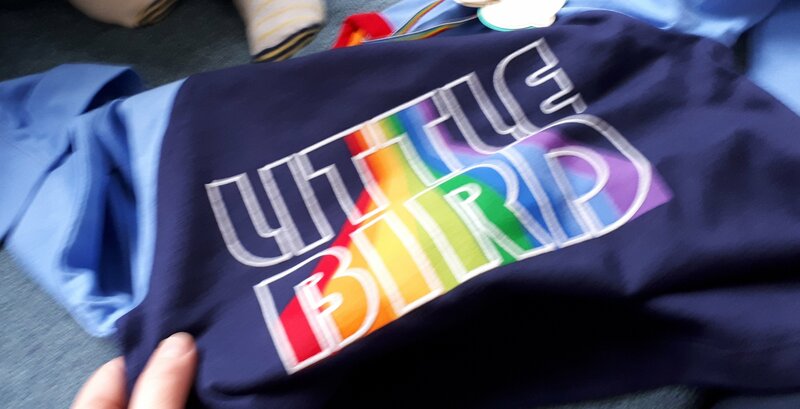 I think I love Little Bird even more thanks to this. 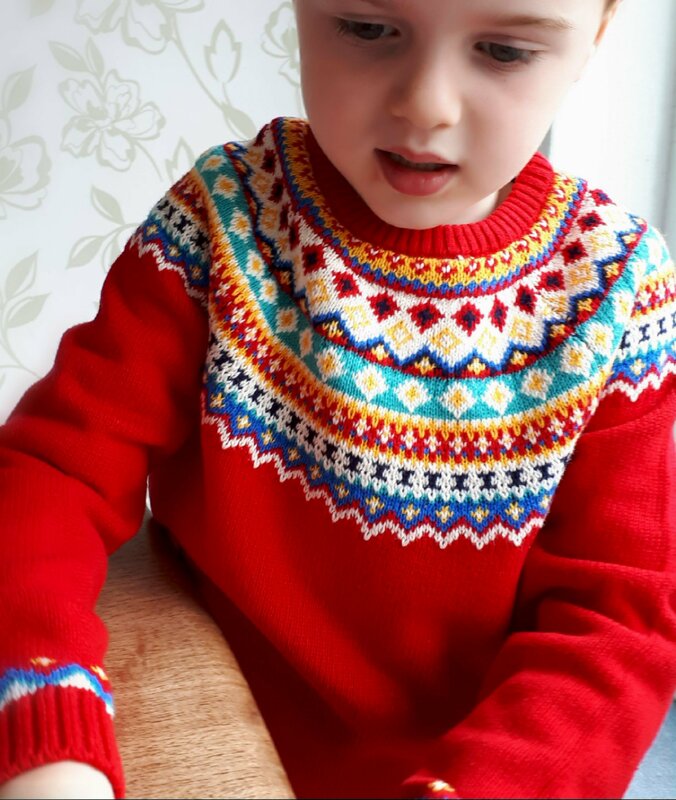 Red fairisle jumpers. Twinning? I bought them one each. They look stunning but I’ve ordered online so fingers crossed the quality is great; we have had other knitwear garments from Little Bird and they are usually wonderful. There is also a mama version. I’m so torn as I think it’s so beautiful but I never suit jumpers like this. They size Small, medium, large and extra large. They are roomy. Perfect if you are pregnant, perfect for twinning with your kids. I’m a size 16 and a large was plenty big on me. 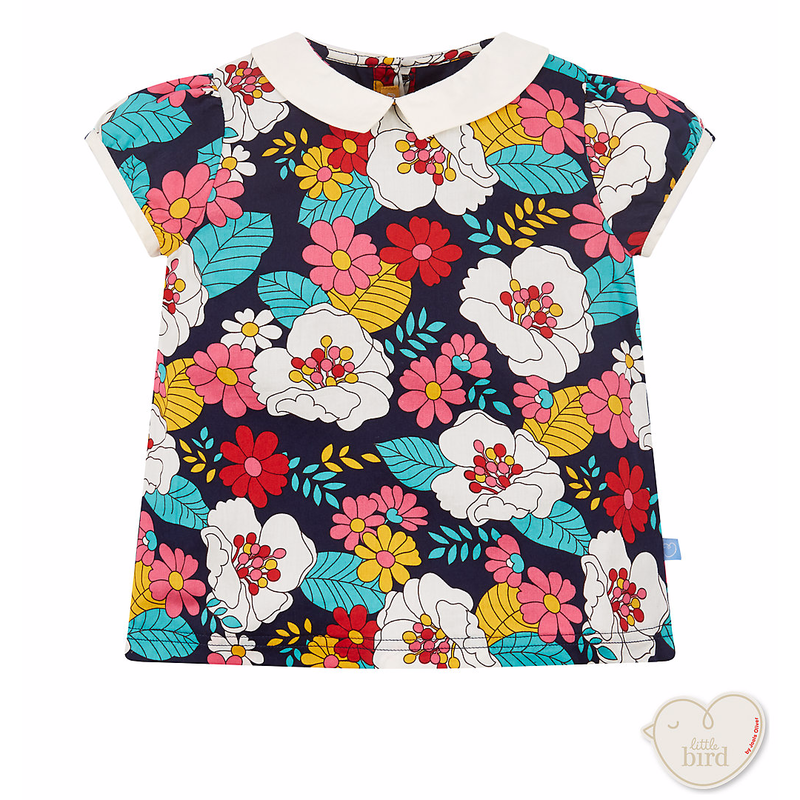 Floral woven top with collar. I love this print. I love teal too. Can not wait to put this on the wee G.
T has asked for the fan club tee so I’ve bought it to pop into his Christmas present. Little Bird branded raglan tee with fan club print to the back. I ummmmed and arhhhhed about the Christmas pjs. I really like them but I’ve already stashed away their Christmas Eve pjs ready, so I refained. I’ve got a bright pair of countryside pjs for G and glow in the dark space pjs for T. The top sizes of the Little Bird pjs sold out online in the morning so they are super popular. Let’s open the box or the grey parcel bag. G does. First up it’s the Christmas jumpers. They are stunning in real life. G loved hers so much it was on straightaway. I bought a 2-3 yrs. She is 19mths. It’s slightly long on her but that is to be expected. I love the bold colours. 100% cotton T says they feel really good. 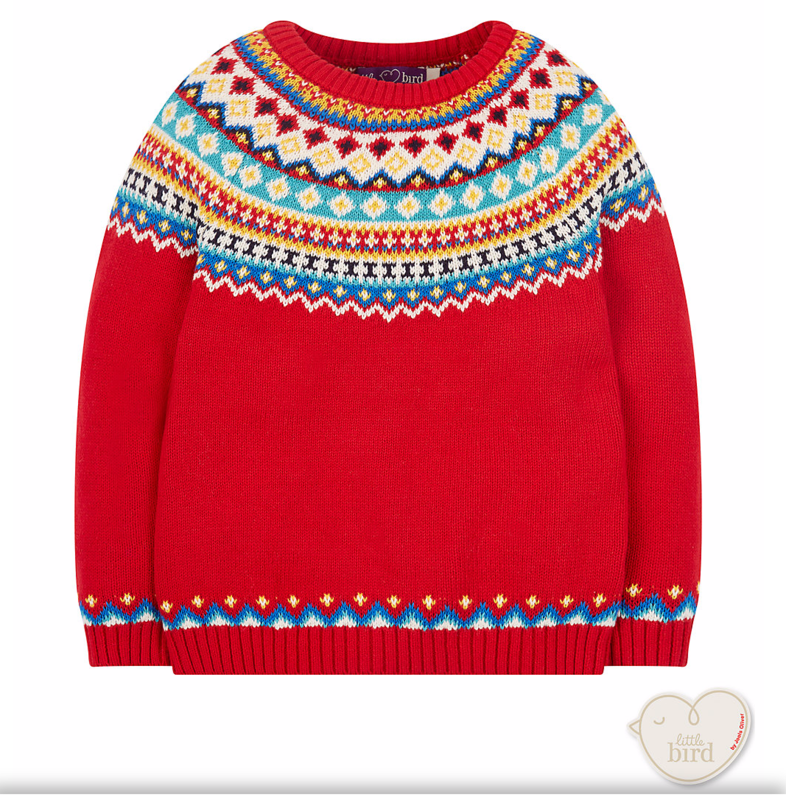 A perfect Festive jumper without being too festive. Definitely worth the ticket price. T didn’t want to know about a parcel arriving however was won over by the jumper. Size 5 to 6 on a tall, just turned 5 yr old. Mr TplusG was jealous he wants one! I didn’t tell him they do adult sizes. 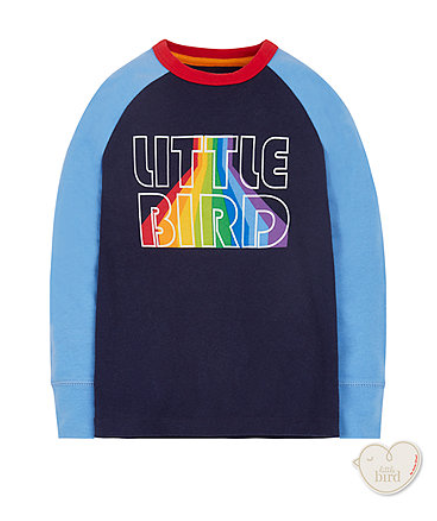 The raglan Little bird logo tee. Gorgeous late seventies graphics. They remind me of turning on my 80s games console to play Thundercats. Long sleeves, soft handle and nice length. We generally size up on tees so this is 6-7 yrs. 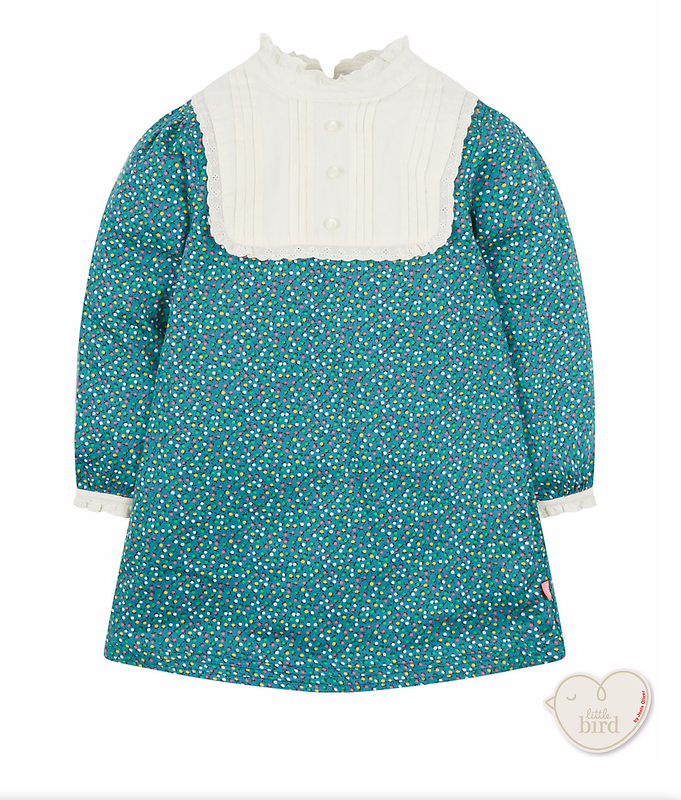 It is perfect for us but it signals only another year of Little Bird for T.
Now the floral Wednesday dress. G loved it and wanted it on over her Christmas jumper. Perfect for Christmas day with bright tights and a cardie. I might try to match. Wish this dress came in my size. The love is in the details. The pearly buttons and the off white bib. Lastly it’s the floral top. I bought a size 2-3 so it can be worn as a dress/tunic and then a top later. 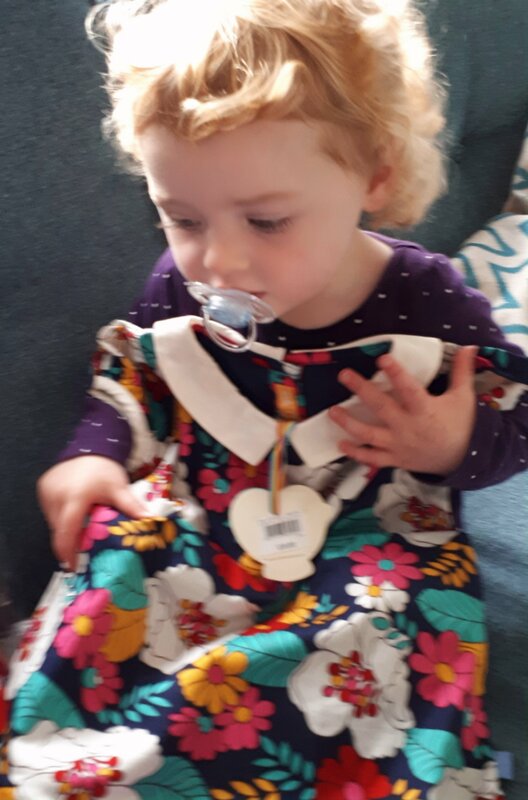 It is an oriental inspired print and the blooms really suit G. Another thing I love about Little Bird is mixing up the seasons. I feel an outfit build coming on. Summing up I wish they were in my size and I’m so looking forward to Christmas. Roll on December. I think the jumpers are going to be well worn. Stock images taken from Mothercare website. Grainy unboxing images from me and my smartphone.